Mid-Life Cruising!!! : A New Bulkhead! 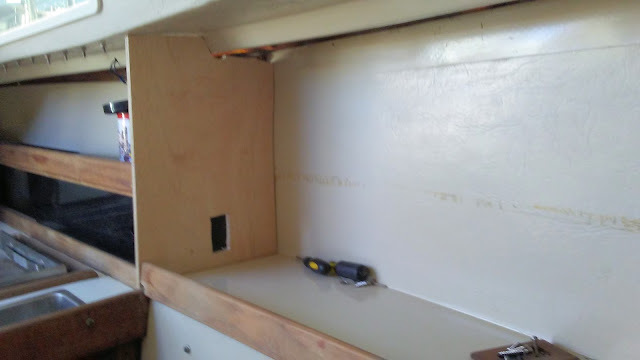 While Ken was dreading this project, I couldn't wait to see this old, ugly bulkhead gone! This bulkhead is in our salon, which is another word for our living room. I hated seeing the big strip of metal holding the rotten wood together, and I hated the excessive varnish & yellowish color. This didn't seem to be the original bulkhead. 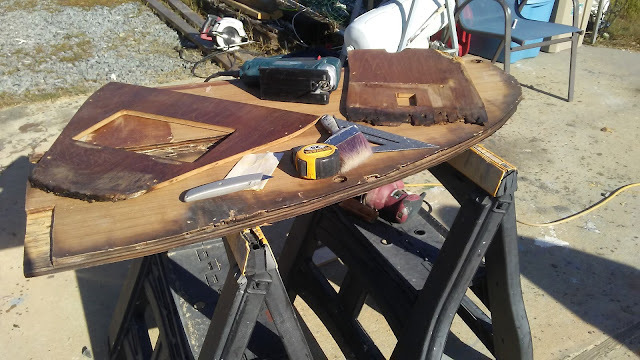 Ken was able to remove the original teak trim from the bulkhead without damaging it, and the bulkhead came out pretty easily. 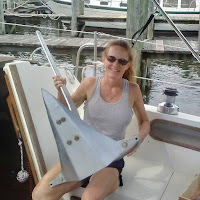 The chainplate was removed and the starboard halyard was secured ... and the mast didn't fall down! 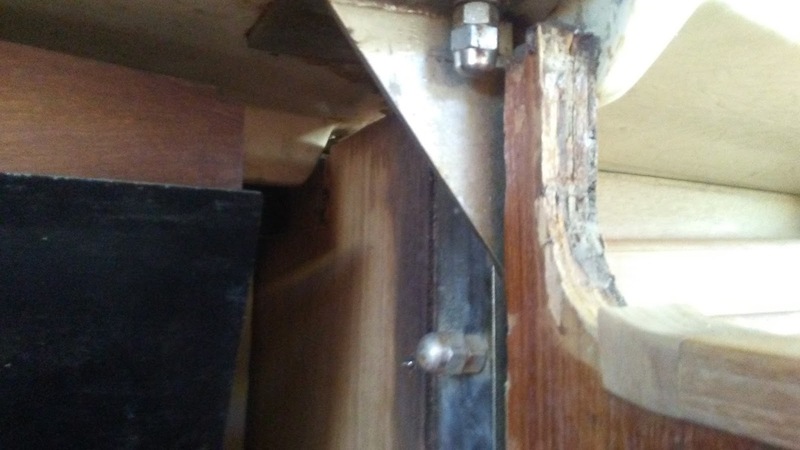 The top shelf that sat on the adjoining cabinet was also water-damaged and removed. (Note the plumbing hoses ... and you'll understand why replacing them is on our project list .. yuck)! 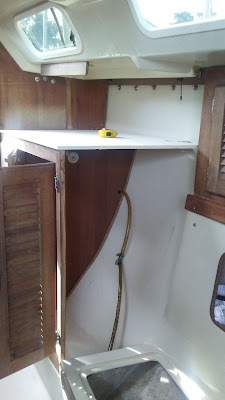 Here's a pic of the new cabinet shelf (with plumbing cut-outs), and a new piece for the v-berth (with cut-out for door). Ken used the old pieces as templates, and for the bulkhead he used two 1/2" pieces glued together. 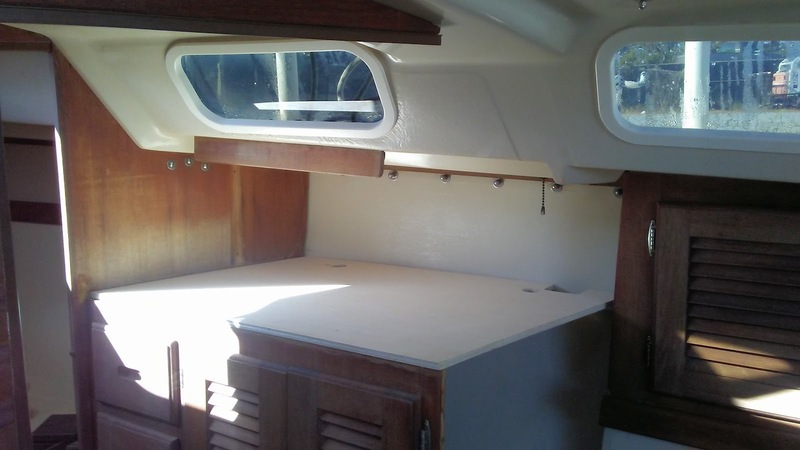 Here's a pic of the new divider between the galley & salon on the port side. We removed the water-stained and overly varnished teak shelf in hopes of reviving it .. and we did! 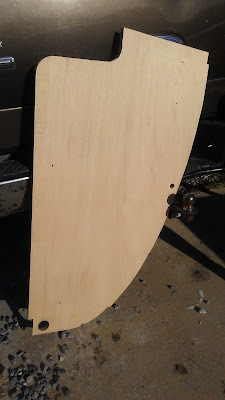 I'll write a post soon about a product used to clean metal & plastic that worked wonders! Ken stained the new wood with a "natural teak" color by Zar. It was a great match to Nirvana's interior teak. 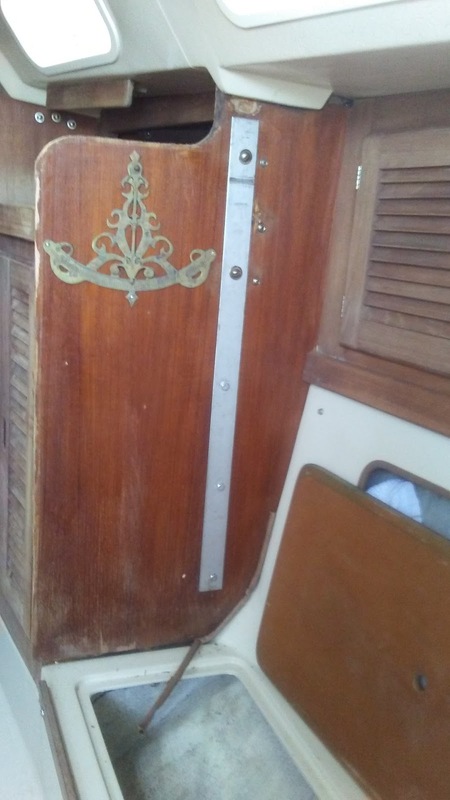 The new bulkhead was installed, the chainplate was re-attached, and the original trim pieces were added. The new bulkhead looks so much better, and it's no longer a safety issue. Removing all of the rotten wood was such a mental boost for me! We were finally starting to work on Nirvana's interior .. and make her look like home. 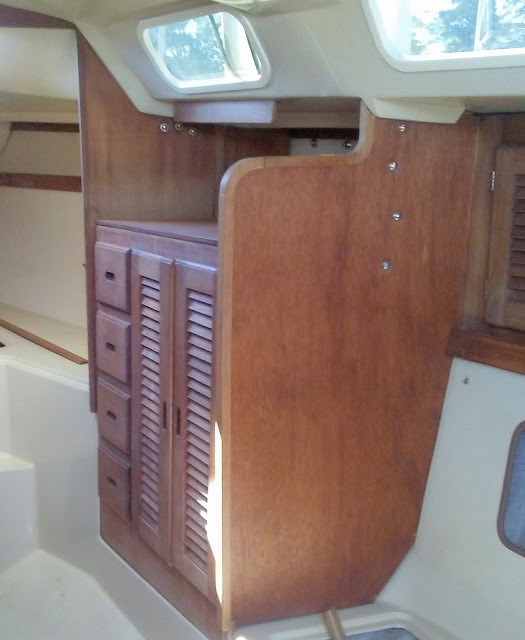 Just before this project, I had spent 3 days cleaning & sanding the worn & stained interior teak in preparation for Ken to coat with a satin finish polyurethane. Since this bulkhead project, Ken has removed all the drawers & doors from Nirvana and brushed them with two coats of spar poly. He also coated all of the interior teak that couldn't be removed, and Nirvana is starting to look like a new boat. She is looking so pretty inside .. no more rotten, dirty wood! I cleaned every nook & cranny inside, and I can't wait until Nirvana is put back together and we can bring the cushions home (from my Dad's) for recovering. 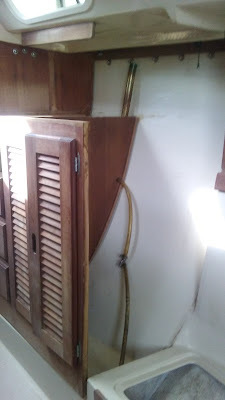 I'll write a post soon with pictures of the refinished teak after the doors & drawers are put back, but first we're going to clean the water tanks, replace all of the plumbing hoses, and replace the head & galley faucets. Tomorrow is Thanksgiving day, and we have a lot to be thankful for! 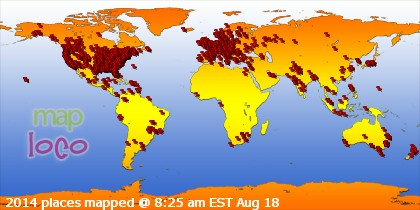 Looking good...all that hard work but look at the results! I'm betting you will also have kinda a "new boat" smell, rather than the smell of wet or rotting wood! 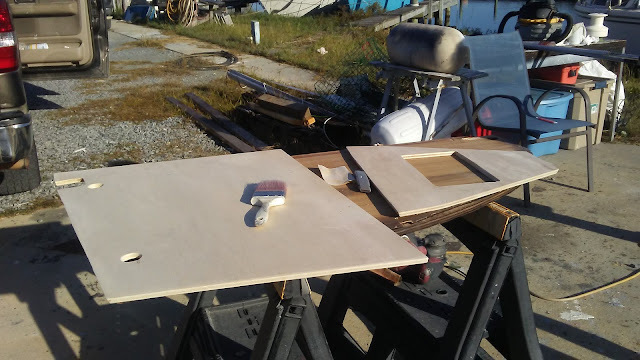 As a woodworker myself (NOT a carpenter or contractor! ), I can appreciate Ken's work... and even when you first mentioned it, I knew what Ipe wood was! Hard as STEEL! That's looking really good. I'm sure it just gives you more energy just seeing the progress. In preparation for removing the chainplate, did y'all loosen any of the other rigging or just secure the halyard for support? Gerry, the boat definitely smells much better! Mike, Ken just secured the halyard when removing the chainplate. Although I kept telling him "that's what I read" and "it would be okay" .. he was worried about doing this. Luckily, I was right .. LOL! Thanks for the kind words ya'll!